An elderly Chinese man and woman chat at a park in Shanghai. Hundreds of elderly Shanghai residents make their way to IKEA twice a week for an informal lonely hearts club. If you're retired, single and looking for love in Shanghai, try IKEA. Twice a week, hundreds of Shanghai residents who have formed an informal lonely hearts club of sorts gather at the cafeteria of the Swedish furniture megastore for free coffee and conversation. The pensioners begin arriving around 1 in the afternoon and fill nearly 20 tables in the store cafeteria. They sit for hours drinking coffee, gossiping and subtly checking each other out. "You can find a boyfriend or girlfriend, or just make friends and chat. It makes you a little bit happier," says Ge, a smartly dressed 50-year-old woman who retired this year. Ge's friend, with the surname Han, is a retired bus-ticket seller and says IKEA is a good place to meet people if you're divorced or widowed, because there is so much matchmaking going on. "If I meet a guy and he's appropriate for me, we can call each other," Ge explains. "But if he finds someone more suitable for me, he'll help and introduce me to the other guy." Both women refuse to give their full names because they don't want their families to know they visit IKEA. Han says it's just too embarrassing. "When we go out, we don't tell people we're going here," Han says. "We tell them we're going to a tea house. We don't tell them we go to IKEA, because IKEA is the place to find boyfriends and girlfriends." Retirees began coming to the IKEA in Shanghai's Xuhui district about three years ago. The phenomenon is a result of the nation's rising divorce rate, changing demographics and the comfort of the stores themselves. Shao, a former manager at a local Unilever factory who won't give his first name either, is 70. 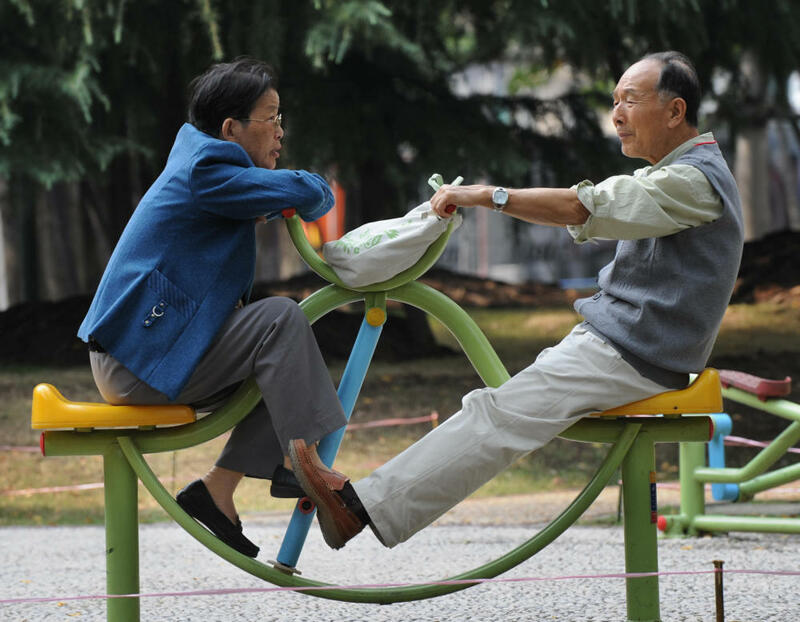 "Shanghai has become an aging society with many single senior citizens," Shao says. "They need to make friends, they feel lonely at home. So what IKEA does is laudable, and we wish IKEA's business will prosper. I am thankful for IKEA's tolerance toward us." Actually, IKEA's tolerance has pretty much run out. The company is tired of the lonely hearts drinking gallons of coffee but never buying anything. Recently, when some lonely hearts became unruly, IKEA cordoned off a section of the cafeteria to pen them in. IKEA managers refused to discuss the problem — they don't want the publicity. But they have posted a sign that reads: "Your behavior is affecting the normal operations of the IKEA cafeteria. Frequent fights and arguments do serious harm to the image both of Shanghai residents and IKEA." Torsten Stocker studies consumer products in China for Monitor Group, a U.S.-based management consulting company. He says Chinese feel comfortable being themselves in IKEA because the shopping experience is so different from most here. "It feels more like a place of leisure than a place where you would buy furniture," Stocker says. "You know, it also represents to some extent the home that they aspire to and they would like to have." In fact, some Chinese have always treated IKEA like an extension of their own homes. When the first store opened in Beijing in 1998, people napped on the beds. Families camped out on sofa sets, reading newspapers, drinking tea from glass jars and eating biscuits. Ge, one of the lonely hearts, admits they don't treat the company very well. "I don't think it's appropriate, because this is a money-making business," Ge says. "The best thing would be if we had places like this in our own community, even if there is no coffee or tea, we can bring our own." For now, IKEA and the lonely hearts are in an uneasy truce. The long-suffering Swedes are unwilling to force the Chinese seniors out. And the lonely hearts don't want to give up IKEA's modern comforts — and all that free coffee.